The warmth of wood grain. The sleek appearance of metal. The cool of natural stone, as well as hundreds of other choices. 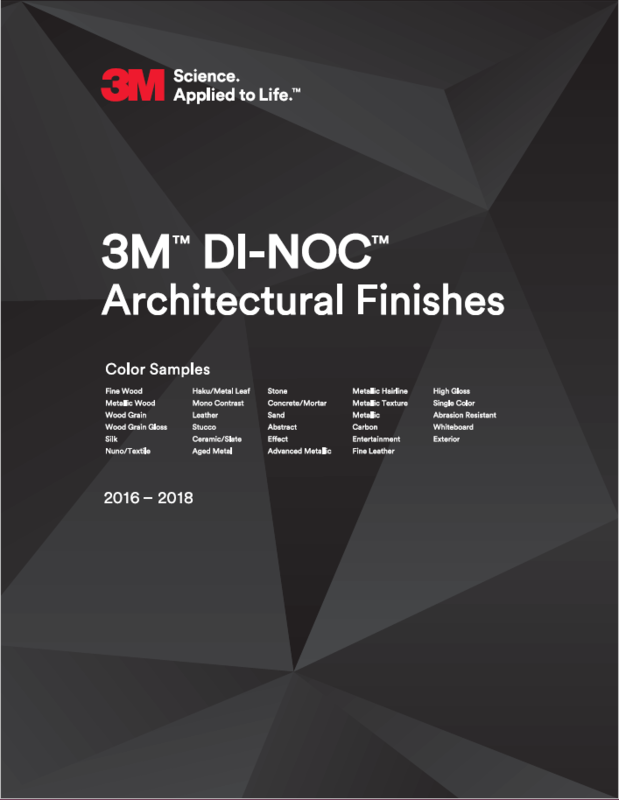 With more than 700 finishes, including over 200 new designs, 3M™ DI-NOC™ Architectural Finishes offer a highly flexible collection of materials that conforms to flat or curved surfaces, providing unlimited design potential for interior and exterior architectural elements. New DI-NOC™ range: See It Before Anyone Else! 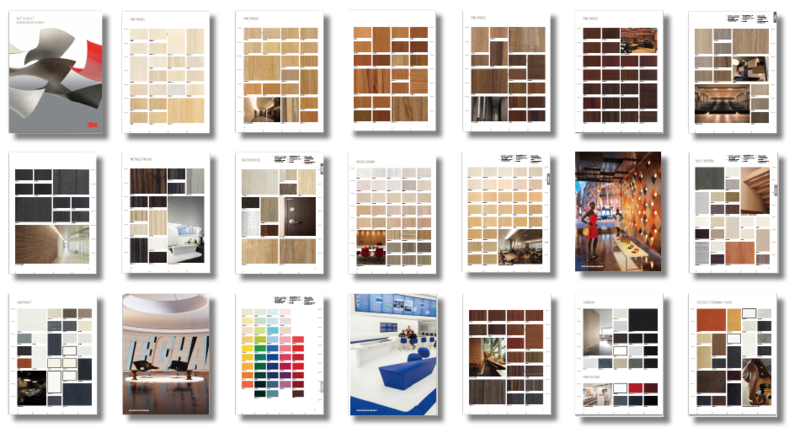 Introducing DI-NOC™ designs including Rustic Wood, Concrete and Silk/Woven! 3M™ DI-NOC™ films are adhesive foils made of several layers of polyvinyl chloride. They are flexible as they adjust even to rounded areas and molded surfaces. There are no visible cuts or overlaps when laid in place such as would occur with natural materials, e.g., wood paneling. The adhesive film weighs very little, a real advantage for interior designs for elevators or trains, for example. A key component of the films is the Comply™ adhesive technology, which enables the films to be laid without any bubbles or folds arising, even if they have to be repositioned several times. This certainly simplifies designing and redesigning walls, entrances, false ceilings, and furniture – even during working hours in shops, restaurants or other establishments. 3M™ Whiteboard Film is a range of high quality films with whiteboard and projection screen capabilities! 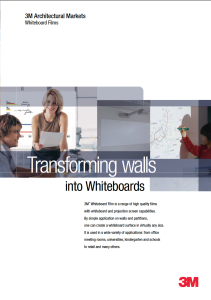 By simple application on walls and partitions, one can create a whiteboard surface in virtually any size. It is used in a wide variety of applications: from office meeting rooms, universities, kindergarten and schools to retail and many others. Communicate by writing, communicate by projecting. The great news is we carry stock! DI-NOC™ and Fasara™ more cost-effective and easier to purchase. This means we can work on a project-by-project basis and offer our customer’s fantastic flexibility and stocking options if required. Click to view our stock offerings or call us today on (09) 442 4383 to discuss your requirements. 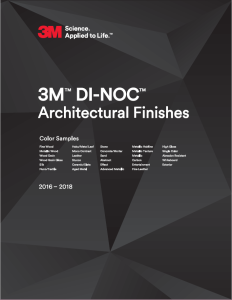 3M™ DI-NOC™ Architectural Finishes Catalogue The full range of 3M Architectural Film. 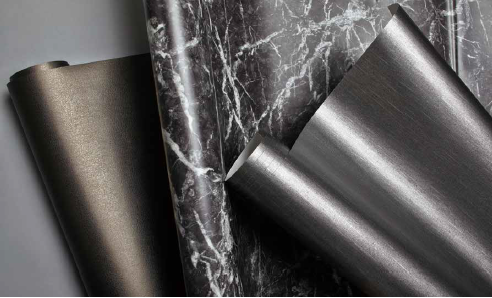 Includes: Fine Wood, Metallic Wood, Rustic Wood, Wood Grain, Silk, Woven, Abstract, Concrete, Stucco, Ceramic, Rust, Sand, Stone, Metallic, Carbon, High Gloss, Leather and Pure Colour. Click to view. A range of self adhesive and non-adhesive whiteboard and projection films. Improve creativity and productivity by making whole walls as whiteboard and screen! The film is easily erasable and washable. Click to view. If you’re looking for inspiration on an international scale then this brochure is for you. Creative alternatives to any materials! Learn about the aesthetics, design freedom and quality and durability of DI-NOC™. 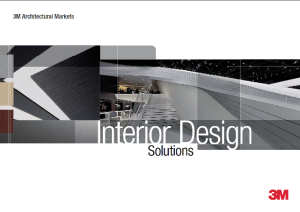 The market segments in which 3M offers its technological and design capabilities range from office to hospitality, health care, retail, corporate and even marine, interior and exterior application. Click to view.